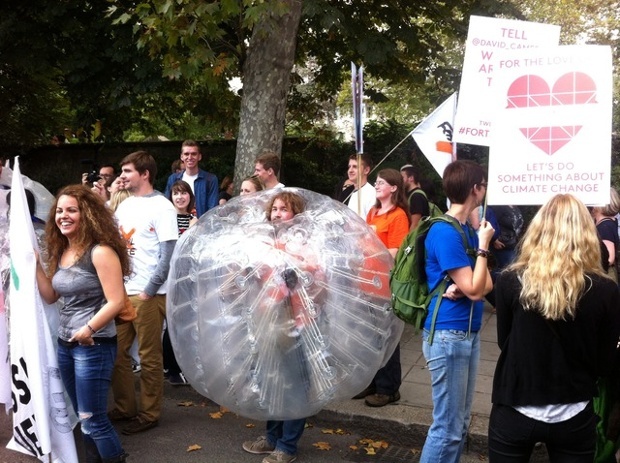 Campaigners marched through central London on Sunday to demand global action on climate change, in one of thousands of events worldwide ahead of a UN climate summit. Some 2,000 events took place in 150 countries, with more than 100,000 people taking to the streets of New York – where the summit is being held – to demand leaders take action to tackle rising temperatures. The summit has been convened by the UN secretary general, Ban Ki-moon, in a bid to drive action and momentum towards talks in Paris in 2015, where it is hoped a new global climate treaty can be agreed. In London, campaigners were joined by celebrities, including actress Emma Thompson and musician Peter Gabriel, and church bells rang to mark the march through Westminster to Parliament, where speeches and a rally were held. In a statement on his website, Peter Gabriel said: “This big blue ball is the only possible home for humanity in the near future. If our family home was being destroyed and poisoned in the same way, we would do something immediately.